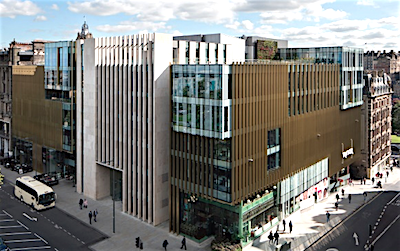 Edinburgh-based investment giant Aberdeen Standard Investments is close to agreeing a deal to sell its HQ at at 6 St Andrew Square in Edinburgh, according to a report in Property Week. The report claims The Standard Life Pooled Pension Property Fund is in discussions with three parties to sell the HQ for around £130 million, reflecting a yield of 4.25%. The HQ was developed by the fund in partnership with Peveril Securities and was officially opened last year by the Princess Royal. The report said the fund, which is run by David Stewart, is thought to have approached three international parties off-market – believed to include a German fund and a Korean fund – with the investment opportunity. Aberdeen Standard announced that it would pre-let all the office space at 6 St Andrew Square in 2015. At the time, it was the biggest office pre-let in Edinburgh for a decade. It signed a 15-year lease at a rent of around £3.2 million a year, and moved 1,000 staff to the building. The report claims the decision to sell the HQ, which comprises 100,000 sq ft of offices, 65,000 sq ft of shops and restaurants and five apartments, comes after a period of “poor performance” for the Standard Life Pooled Pension Property Fund. The size of the fund fell from £3.15 billion in September 2018 to £2.96 billion at the end of December, the report said. The report said Savills is advising Standard Life Pooled Pension Property Fund and that all parties declined to comment.